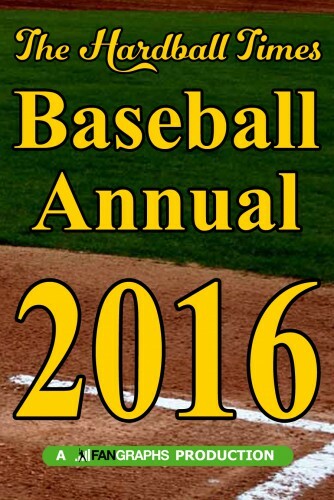 The 12th edition of The Hardball Times Baseball Annual is now for sale in print form. You can purchase it in print from either Createspace or Amazon, and also digitally on Amazon for the Kindle. The book is a labor of love for our editors–Joe Distelheim, Jason Linden, Greg Simons–and for me. Travis Howell designed the cover once again, and this year, Sean Dolinar joined the process, as he edited the book’s graphics. The book clocks in this year at 362 pages, and is priced at $15.99. In order to encourage your comments and feedback on the book, we’ll leave this post in the sidebar on the homepage for the foreseeable future. We get your great feedback on our articles each and every day, but we don’t always know how you feel about the Annual. So let us know here! Here is our table of contents. The book is broken into four sections — 2015 season, Commentary, History and Analysis. Division reviews by Tim Healey (AL East), August Fagerstrom (AL Central), Miles Wray (AL West), Alex Remington (NL East), Greg Simons (NL Central) and Dustin Nosler (NL West). We took a different approach with these this year. We looked at the three games/series that swung the division odds the most in each division, and have also included a sidebar about the 10 things that you should remember from each division. Brad Johnson recaps the postseason through the lens of ChampAdded. Kiley McDaniel on the international draft, and if it should be combined with the domestic draft. Jeff Sullivan examines the explosion in home runs. Dave Cameron goes in-depth on why the next collective bargaining agreement is likely to be a much more difficult negotiation. Alex Skillin puts Dan Duquette inside our GM in a Box. Jack Moore examines Rob Manfred’s first year as commissioner. Erik Malinowski looks at the 2015 Mets’ starting rotation, and how it compares to its predecessors. Joe Distelheim wraps the section with a clever poem on the 2015 season. Adam Dorhauer exhaustively researched his piece on the cancellation of the 1904 World Series. Frank Jackson details how there is always a reason to go to the ballpark. Steve Treder looks at the tumult in baseball from 1965-1975. Joe Distelheim looks at the Tigers and the city of Detroit, circa 1984. Carson Cistulli goes back in time with his NERD scores. Eno Sarris interviewed scores of people in the game and received a care package from Sportvision in the form of previously unreleased COMMANDf/x data for his piece on pitcher command. David Kagan investigates the physics of the longest home runs. Jeff Zimmerman creates values for trading prospects. Bryan Cole and Dan Kopitzke team up to combine technologies to measure swing development. Neil Weinberg analyzes catcher pop time, with some new, previously unreleased Statcast data. Shane Tourtellotte studies player performance by height to see if bigger really is better. Joe Rosales and Scott Spratt break down the differences between full and partial defensive shifts. Jonah Pemstein shows us how it’s impossible to identify DIPS beaters. Chris Mitchell looks to supplement minor league statistics with background data. Peter Bonney creates a new metric for measuring umpire consistency. So there you have it. We’ve been very excited about getting this book to you, and now, the wait is over. You might not be interested in all of these topics, but within these 362 pages, you’re going to find something that you like. 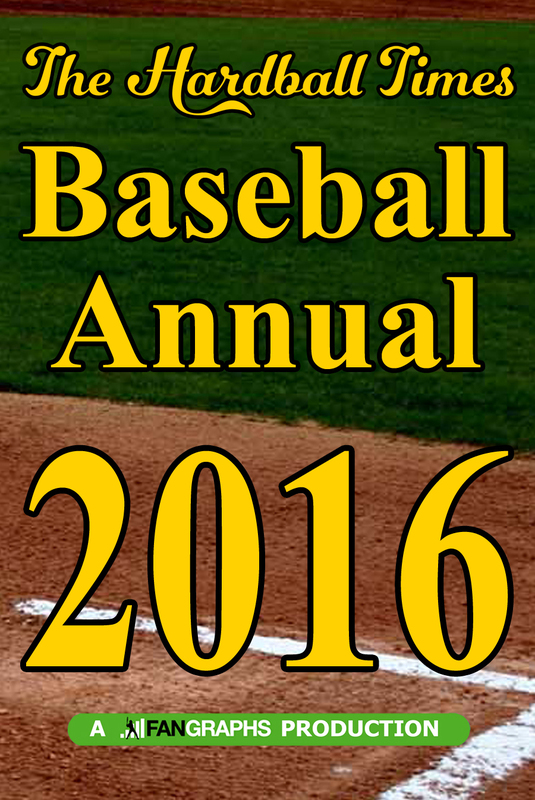 Start your winter off right with a copy of The Hardball Times Baseball Annual 2016! When I first saw this title Nasaece ristique orci ferode fereaseras | on google I just whent and bookmark it. Wonderful web site. Lots of helpful information here. I am sending it to several buddies ans also sharing in delicious. And naturally, thanks for your effort!